.50 ammo cans are readily available at military surplus stores at mostly reasonable prices (from $5-$20), which is why they make good storage cans for various items. However, because of their large size they are not always great organizers for smaller items. But one product aims to change your .50 cal organization problem. 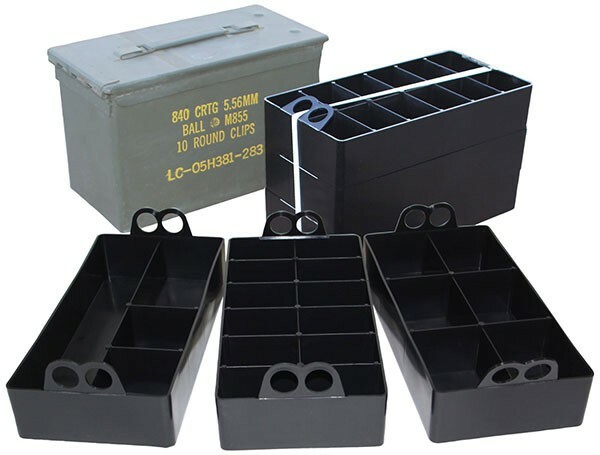 MTM, a company that makes their own plastic ammo cans and other ammo holders has come out with a set of stackable plastic trays that have been specifically designed to fit inside metal U.S. military .50 ammo cans. Their design is probably to allow you to keep various ammo types organized in the large can, but they can just as easily be used for other non-ammo related organizational problems.